November 8, 2015--This has been an excellent vacation, despite the weather (rain, rain, and more rain). When we received the invitation to attend Webster's 90th birthday party, we decided to make a vacation out of the event. Originally, we intended to arrive at Webster's on Friday and leave on Monday morning. From there, we weren't sure where we would go...perhaps to the barrier islands, perhaps to the mountains. We tried to find camping on the barrier islands (outer banks). All of the state parks are closed for the winter. We found some private RV parks, but their cost was prohibitive. So we canned the idea of camping on the islands. It was then that Jim remarked that Colerain (the town of 200 in which Webster resides) is close to the Virginia border as well as the outer banks. Also, he said, that whole area was "full of history." I'm sure I knew it at one time, but I had forgotten that North Carolina was one of the original 13 colonies. The coastal areas of North Carolina are rich in history, dating long before the Revolutionary War. We decided to make Webster's backyard our home base and explore the coastal area and fish through day trips. Our first stop was Edenton, a small community of less than 8,000. Sitting on the Albemarle Sound, its quaint colonial downtown stands sentry over the waterfront, complete with a number of cannons from the Revolutionary War era. Outside of the town is the Edenton National Fish Hatchery, where shad, bass, sturgeon and other species are hatched, raised, and released in area streams and lakes. The biologists had just finished loading some fish into tanks to be transported to other locations, but one of the biologists took time to show us how the fish are hatched and raised. He also showed us some baby sturgeon. I did not realize how prehistoric they look! No scales! We took a short hike on the 25-acre property. As we were returning to the car, the biologist started to feed the baby fish in the several ponds. Even before the food pellets hit the water, the surface teemed with thousands of fish, waiting for their meal. He said they hear the tractor and the food machine approach and wait to be fed. From the hatchery, we drove into Edenton and found the visitors' center, which is in the Penelope Barker house, located on the waterfront. The visitors' center also serves as a small, free museum that shows off a number of items, mostly maritime-related. A half block away from the visitors' center was the Roanoke River Lighthouse, which opened on the Roanoke River, about eight miles away from its current location, in 1866. 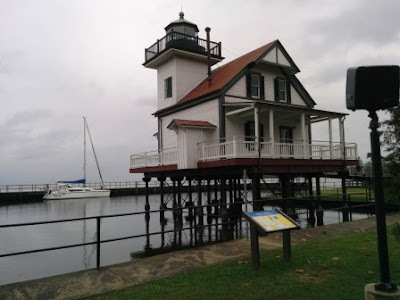 Roanoke River Lighthouse, Edenton, N.C. This lighthouse is believed to be the last remaining square screw-pile lighthouse, which helped guide mariners along the North Carolina shore. The lighthouse was decommissioned by the Coast Guard in 1941. Finally in 1955 a private citizen purchased the lighthouse and had it moved to Edenton, to serve as a private residence. In 2007 the structure was moved to a location on the Edenton Waterfront in Colonial Park. In 2012, it was again moved to its current (permanent) location over the bay, in Edenton Bay. The interior restoration was completed in 2014. We also drove around Edenton and looked at the historic buildings. During the summer, the town has trolley tours available for tourists. The next day, we drove up to the coast to see Kitty Hawk and to fish. The biologist we spoke with at the hatchery had told us fishing was really good right now. The Wright brothers had their historic first flights at Kill Devil Hills, a few miles south of the town of Kitty Hawk. A small museum houses reproductions of their first manned airplane, as well as the glider they used to learn about flying like the birds. A monument stands atop Kill Devil Hill. Likewise, monuments identify where the first flight took and where it landed (quite a short distance! ), as well as the spots where the next three flights landed. Each flight grew progressively longer. The first flight on December 17, 1903, lasted just a few seconds and covered 120 feet. How awesome is it that we are able to go beyond the moon in manned aircraft, just 112 years after that first humble flight. 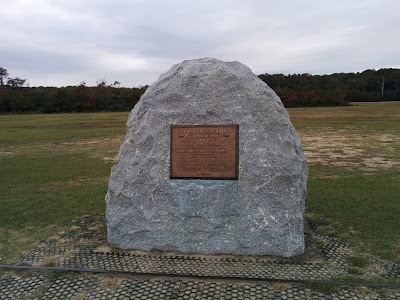 Monument commemorating the site of the first flight of the Wright Brothers. History and museums are interesting, but we wanted fun, too. 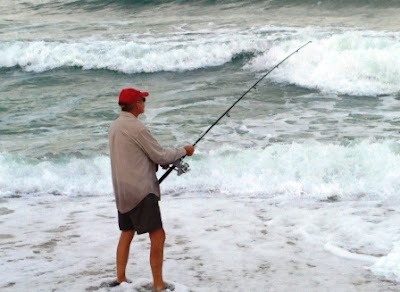 We headed to the beach, where we lugged our fishing tackle to the shore, determined we would pull in all types of fish. It was not to be. But we really had fun. Jim changed into shorts and waded into the surf. I tried to stay dry on the beach. The water was chilly; the sun did not come out; the mist threatened to turn into showers. But we had a great time. We also tried our hand fishing off a bridge. People were pulling them in...until we arrived. Then the wind changed, and the fish stopped biting. Jim got soaked but had a ball surf-casting. He caught one little fish, which he threw back. We finally left Webster's on Friday morning and drove down to south of Wilmington, where we hoped to do go to a kite festival and do some fishing. After calculating the time it would take to get to the kite festival, we decided to stay home. Jim wanted to be back in time to watch the FSU game; I wanted to watch IU. Alas, both teams lost heart-breakers. After the game, we drove into Wilmington. Jim had perused a visitor's guide, which said the city of 89,000 had a river walk. We found the river walk (under construction and not appealing at night). We also discovered that Wilmington has a very vibrant after-dark downtown area on Front Street (near the river walk). Dozens of restaurants attract hundreds of patrons. We ate at a Vietnamese restaurant. We shared a Vietnamese pancake as well as a fried flounder covered with a fruity and vegetable salsa and a tasty sauce (all gluten-free). We've never had such good Vietnamese food. Today, our plans to fish have been squelched by the weather. The temperature dropped to a high of only 58 today, with rain. I doubt we will wet a hook. So what that we can't fish here? We can always fish at home. After all, Jacksonville is laced with creeks and rivers and bordered by the Atlantic Ocean, so we can take a "vacation" any time we want. This vacation, however, has been great.